Emily Miles is an artist and illustrator currently based in Vancouver. Her education includes a Bachelors degree in the Visual Arts, illustration workshops at ECUAD and Central Saint Martins College of Art and Design, and the children’s book workshop with Michael Katz at UBC. She has traveled extensively and shown in Canada, Australia and Taiwan. She is also an elementary school teacher who hopes to inspire her students as much as they inspire her. She enjoys, among other things, sweet milk tea, knitting, kung fu movies, and learning the ukulele. This is one of our all time favourite projects! A project where design has to take a backseat to the work from the artist. 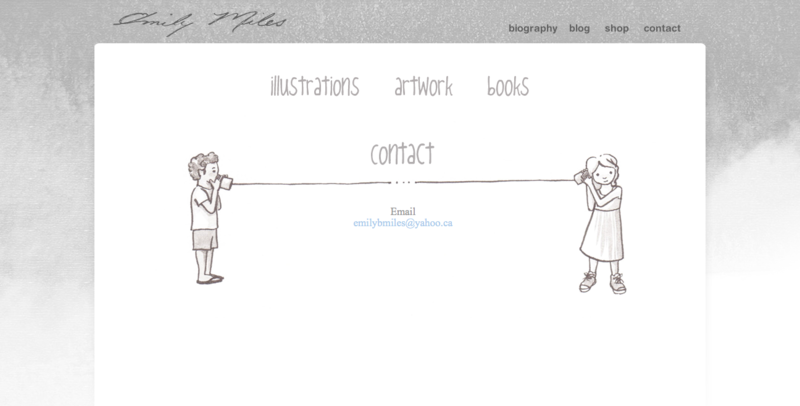 Emily created these charming illustrations for every page of her website. SS Media Co did a fantastic job of taking my vision and making it better than I imagined. The design of the site shows off my work, rather than overpowering it. The site is easy to navigate and easy for me to update. My portfolio, shop, and blog are integrated seamlessly. Scott and Shannon are great communicators and address my needs promptly. They even offered me cost-saving advice on hosting services. They are a magical combination of creativity, technical know-how, and charm!